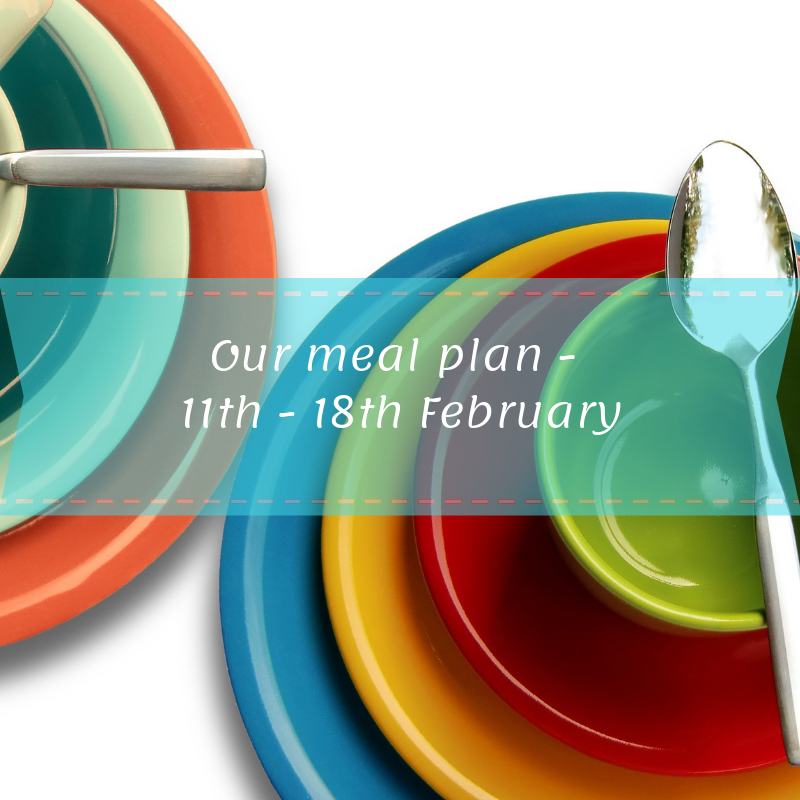 Here I am, back with another food post…and yes, it’s my meal plan for the next week. I didn’t do one last week as I had a different post go up on Tuesday and because it was quite emotive, I didn’t want to follow it up with a meal plan. I find this time of the month the easiest to plan for because all the supermarkets have their free magazines come out. I picked up Asda and Tesco’s last week and every one of our meals this week comes from them (except for Thursday’s which is Valentine’s Day). We don’t do anything “special” but I’m making us a dinner we used to have a lot when we were first dating. But let’s get into the other food we’re having this week. I’ve taken pictures of the recipes but if you fancy making them and can’t see the picture properly, send me a message and I’ll see if I can help! Some of the recipes have needed adapting to make them vegetarian but I’ve just substituted the meat for Quorn alternatives. We are having a fish dish this week and I might eat it, I might not. It depends how I feel on the day. If I don’t fancy it, I’ll probably replace it with a poached egg or something. Pasta made with garlic and herb cream cheese, tenderstem broccoli and chilli flakes…what’s not to love?! Actually, ask my children because I’d put money on them not eating this. To be honest, they probably won’t eat a lot of the meals this week because they’re going through “a phase” but I’m persevering anyway! The beef in this dish has been swapped for the Quorn steak strips and I’ll use vegetable stock instead of beef. It also has chilli in but I’ll either take it out completely or halve the amount for the boys. I’m going to serve it with rice and poppadoms so at least I know the boys will eat something. This recipe asks for chicken sausages which I wouldn’t eat even if I ate meat. So instead I’m going to use Quorn chicken pieces and have it with garlic bread. I’m a bit funny with fish. I like the idea of it but when it comes to actually eating it, I probably won’t. I’d like to cut it out altogether but I do like a tuna and cucumber sandwich! Anyway, this recipe is a take on Welsh Rarebit which we all love. Like I said at the beginning, I’ll probably have it with a poached egg instead. I’ll have some new potatoes left over from the beef curry so I’ll do those on the side. Again, I’ll be using Quorn meatballs for this and after using orzo for the first time a couple of weeks ago, this one is guaranteed to be a winner. It just sounds amazing and I can’t wait to make it. We usually get this from the Chinese so when I saw the recipe in the Tesco magazine, I wanted to have a go at making it myself. I’m not sure how well it’ll go down with the boys but I’ll make some egg fried rice which I know they like and I might get them some spring rolls too. On Thursday, the boys will probably have something like scrambled eggs on toast or fish fingers. Then when they’re in bed, I’m going to make carbonara because this was the first meal Gareth cooked for me. While we don’t celebrate Valentine’s Day, it’s nice to do something to acknowledge it. We’ll probably end up watching something about serial killers…don’t tell me we don’t know how to be romantic! Breakfasts this week are porridge, toast, Shreddies or bagels. Lunches are mainly sandwiches which is nice and easy for me! The boys demand their lunch as soon as they hear that annoying “Lunchtime Song” on CBeebies so I need something quick which will appease them! Hopefully this has given you some foodie inspiration and I’ll be back next week with another meal plan. Previous: Previous post: Is three really the magic number?